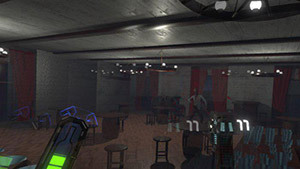 Drunk or Dead is a stationary first-person shooter taking place in a wild west bar in which you need to eliminate zombie. The zombies were real people once but the infection only caught sober people. To stay as a human, you need to drink from time to time. When you drink your shooting will become less accurate but time is slowed down so you have a bit more time to take a good aim and shoot. When a zombie hit you get sober, so you need to play with this mechanic in order to succeed. I really love to play innovative, ones that really makes you admire the creativity of the developer and wonder why no one has thought about making such a game before. Well, Drunk or Dead is one of those game. In Drunk or Dead, you find yourself in a Wild West bar and you need to shoot zombies. OK, sounds pretty lame, but this first-persons shooter features some unique gameplay mechanics in its sleeves. In order to be able to shoot accurately, you need to be sober, or at least close to that. The problem is that the bar is full of zombies that were once regular human beings, but because they were sober, they caught a virus that turned them into zombies. You don't want it to happen to you, right? So gameplay wise, you need to have a drink every now and then in order to prevent yourself from getting the virus, but as you drink your accuracy will drop significantly, making it much harder to take shoot down the zombies. You star seeing things appearing two times on the screen because you are drunk after all. You need to keep a good balance between being sober and drunk. If you get too drunk or too sober, you lose the game. Each time you kill a zombie you get points and a number of points depends on how drunk you are when you shoot down a zombie. When a zombie hit you, you get sober, so if you get hit you need to make sure to drink to balance it and prevent yourself from being too sober. This is a great idea for a game and the good news is that the developer 4lab Ltd plans to release it on the 10th of January 2017 for the HTC Vive VR headset. As of the time of writing, the pending Steam Greenlight support from the community. So if you want to help support the game, head on to Steam and vote for it. A cool first-person shooter with a nice twist - we need more cool shooter ideas like that for VR shooters, which are very common nowadays, but do not really differ too much from one another.